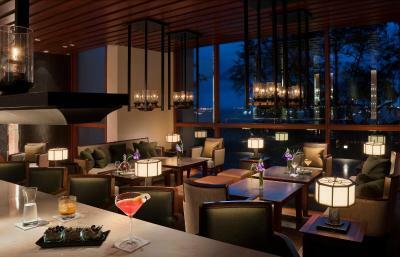 Lock in a great price for Capella Singapore – rated 8.9 by recent guests! It is a very quiet place for a relaxing staycation. The staff are very friendly and helpful. 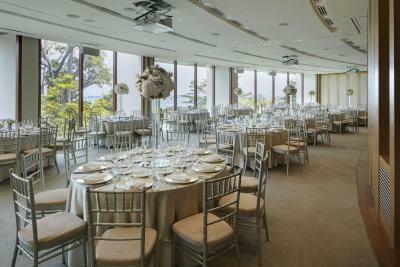 Everything, the location, facilities, Amenities, all the attention they give to details. The Staff & manager were very welcoming, we enjoyed every bit of our stay & were very sad to leave. The random visits from the Monkeys, Peacocks & squirrels was such a joy at our pool villa. Amazing location We have received an upgrade to a Villa and we have had also the possibility for a free late check-out staying in another room Many thanks to the staff and the direction No trouble for next stay in Singapore Se you soon ! extremely amazing getaway location to take timeout from the city life. 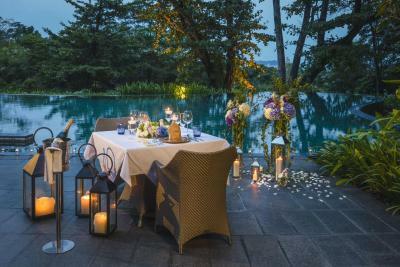 A great place for romantic celebrations as well. 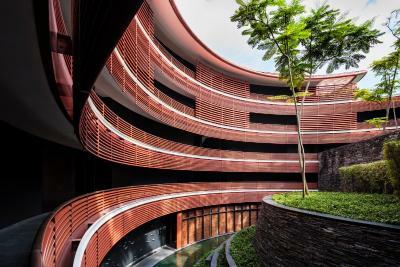 Capella Singapore This rating is a reflection of how the property compares to the industry standard when it comes to price, facilities and services available. It's based on a self-evaluation by the property. Use this rating to help choose your stay! 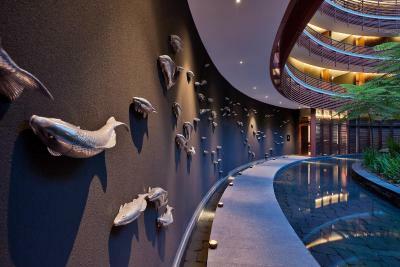 Excellent service starts even before your stay, with personal assistants contacting guests to ensure a smooth arrival at Capella Hotel, Singapore. 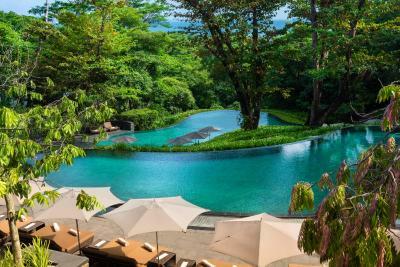 This luxurious hotel is located within the rainforests of Sentosa Island, and features 3 outdoor pools and a multiple award-winning spa. 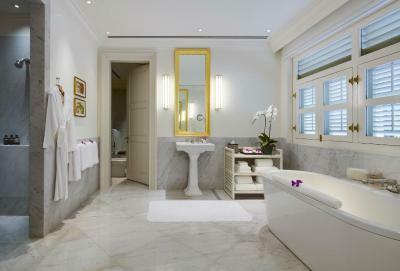 All rooms feature free Wi-Fi and views of the sea or gardens. Union Pay is accepted here. 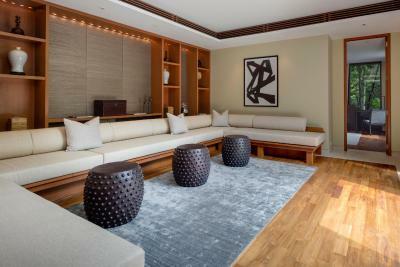 Stylish and contemporary Asian decor features in the guestrooms. Free in-room refreshments like juices, soft drinks and bottled water are provided. 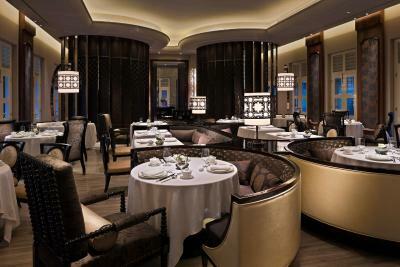 Besides a selection of daily free newspapers, including Chinese newspapers delivered to the room, guests also enjoy complimentary pressing of up to five items. Private bathrooms come with free toiletries and slippers. 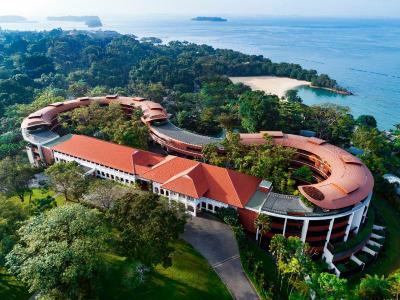 Guests staying at Capella Hotel, Singapore enjoy free admission to Sentosa Island. 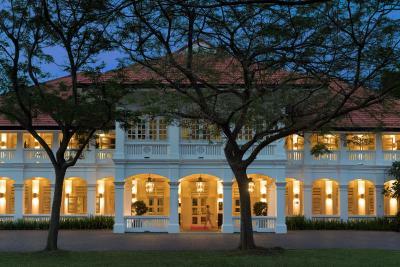 The hotel is a 15-minute walk from Universal Studios Singapore. 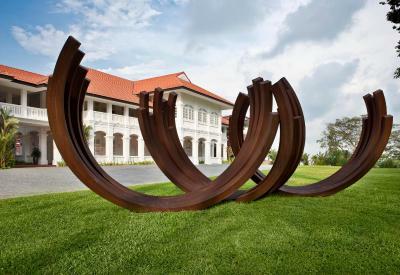 Changi International Airport is a 45-minute drive away. Shuttle services go to and from VivoCity and Harbourfront MRT Station. 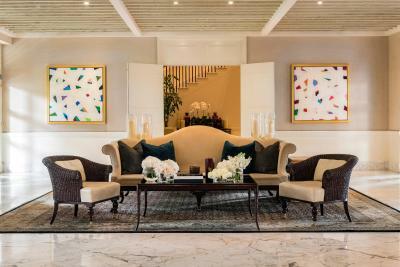 The property offers complimentary scheduled shuttle services to selected destinations to all in-house guests. 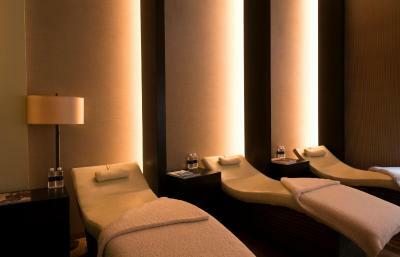 Auriga Spa offers rejuvenating treatments and massage using organic products. The Library serves free snacks and drinks throughout the day, as well as offers DVD rentals, boardgames and magazines. 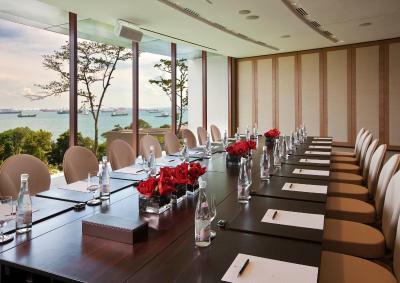 The hotel also offers priority bookings at the premier Sentosa Golf Club. 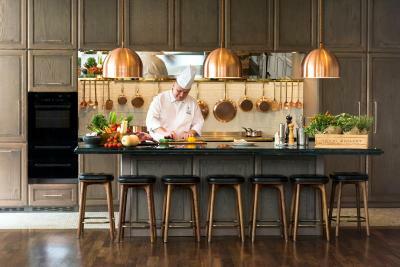 Open for all-day fine dining, The Knolls serves local and international dishes. 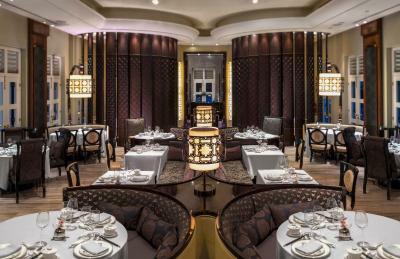 Chinese fine dining can be enjoyed at Cassia, which is housed in a colonial building. Both restaurants offer terrace seating. 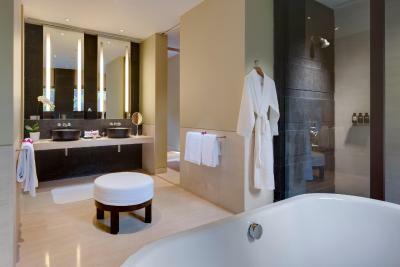 When would you like to stay at Capella Singapore? Enjoying sweeping views of the South China Sea, this spacious air-conditioned room has a King size bed, a flat-screen TV and a large balcony. Private bathroom has a relaxing rain shower. Please note that these rooms can accommodate 2 adults and one child under 3 years old. Cribs are provided upon request. Extra beds are not available. 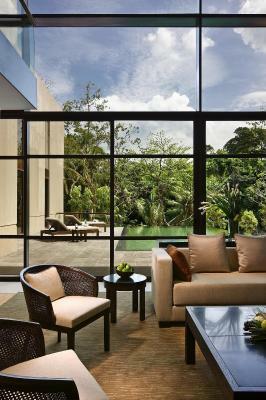 Unwind in the private plunge pool or enjoy a cup of coffee in the outdoor terrace surrounded by tropical gardens. 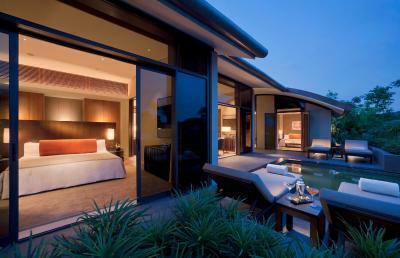 Furnished with a King size bed, this luxurious villa also has a flat-screen TV and an outdoor shower. Please note that this villa can strictly accommodate only up to 2 adults and one child below 3 years old. Babycots are available upon request. Enjoying calming views of the landscaped grounds, this spacious air-conditioned room has a flat-screen TV and a large balcony. Private bathroom has a relaxing rain shower. Please request your bed type preference during reservation. 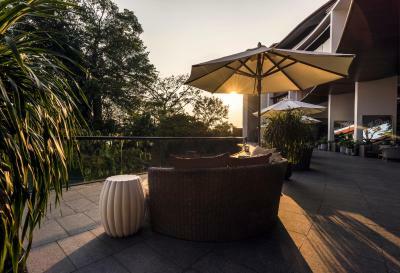 A quiet beachside getaway can be enjoyed in this spacious 3-bedroom apartment, with views of Palawan Beach, the landscaped greenery or the South China Sea. 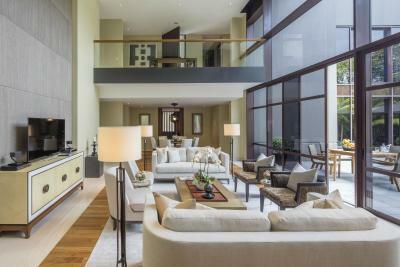 Features a kitchen with designer appliances, a large living room and a dining area. All bedrooms come furnished with their own flat-screen TV and private bathroom. A washing machine is available. A maximum of one extra bed can be added upon request. Extra bed charges apply. 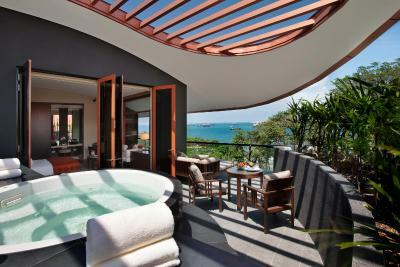 Guests can enjoy views of the rainforest or the South China Sea from the large balcony and relaxing in the hot tub. 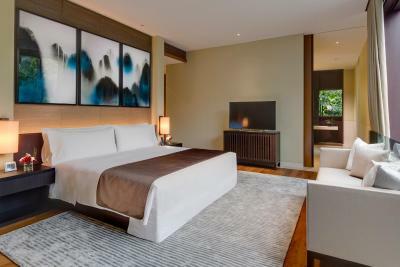 Rooms with a king bed feature a 46-inch flat-screen TV, iPod docking station and BOSE sound system. A Nespresso coffee machine is also provided. The private bathroom has a rain shower. No extra beds can be accommodated. Bed options for children include a complimentary baby crib or a sofa bed. 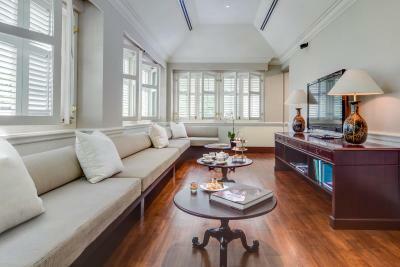 This spacious suite features a living room, separate bedroom with king bed and an expansive balcony with views of the South China Sea. They include an iPod docking station, BOSE sound system and 46-inch flat-screen TV. Suites also have a Nespresso coffee machine. The private bathroom has a rain shower. No extra beds can be accommodated. Bedding options for children include a complimentary baby crib or a day bed. 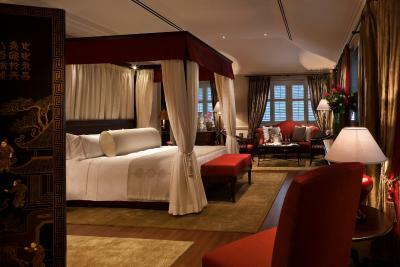 Overlooking the South China Sea, the Capella Suites feature a separate bedroom with king bed, living area as well as a large balcony. They include an iPod docking station, BOSE sound system and 46-inch flat-screen TV. Suites also have a Nespresso coffee machine. The private bathroom has a rain shower. 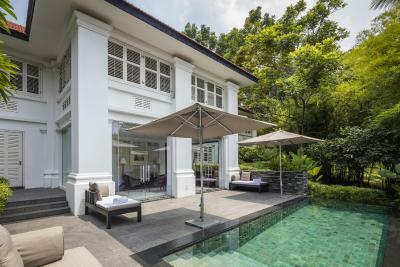 This one-bedroom villa features a spacious terrace with a private plunge pool, and provides the use of 3 cascading swimming pools and exclusive hotel access to Palawan Beach, which is just moments away. Villas come with a separate living and dining area, as well as an outdoor rain shower. They come with an iPod docking station, BOSE sound system and 46-inch flat-screen TV. The private bathroom has a rain shower. A Nespresso coffee machine is also provided. Each villa can accommodate up to 2 adults and 2 children under 12 years old with a free baby crib or day bed. 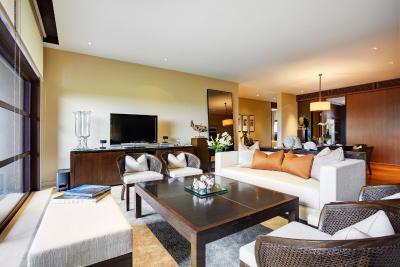 The spacious two-bedroom villa features a spacious terrace with a private plunge pool. Villas come with a separate living and dining area, as well as an outdoor rain shower. They include an iPod docking station, BOSE sound system and 46-inch flat-screen TV. The private bathrooms have a rain shower. A Nespresso coffee machine is provided. Bed options for children include a free baby crib or a day bed. The Colonial Manors are conservation buildings, which have been beautifully restored. 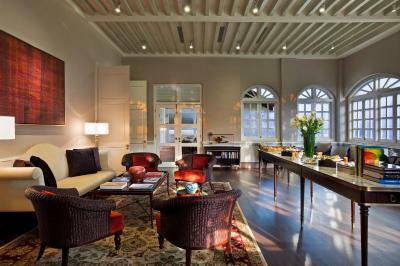 Each luxurious manor features 3 spacious bedrooms with private bathrooms, 2 living rooms and an elegant dining room. There is also a study, full kitchen and private lap-pool. 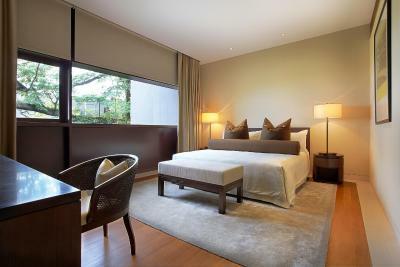 The Contemporary Manor is set in the middle of Capella's beautifully-landscaped grounds. This spacious 3-bedroom accommodation has private bathrooms and features a large swimming pool and outdoor living spaces. 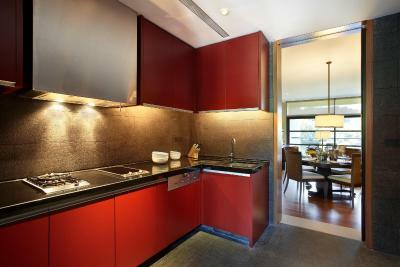 It also has a separate living and dining area as well as a designer kitchen. This twin room features a balcony, bathrobe and DVD player. 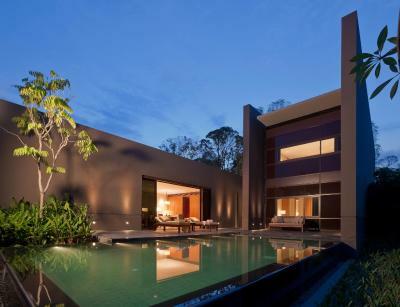 This villa has air conditioning, private pool and DVD player. Hotel surroundings – This neighborhood is a great choice for travelers interested in Universal Studios, cleanliness and food – Check location Great location - show map Guests loved walking around the neighborhood! 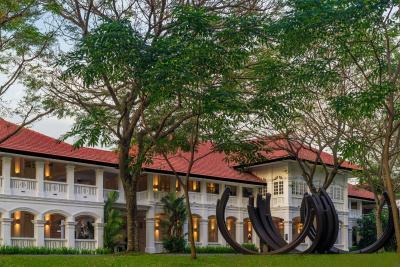 House Rules Capella Singapore takes special requests – add in the next step! Capella Singapore accepts these cards and reserves the right to temporarily hold an amount prior to arrival. Please note that no outside food catering is allowed. Everything was fantastic. Staff went out of their way to accommodate our room change request. Great that the staff keep the top pool for adults only - very relaxing. Breakfast has an excellent choice and the grounds and beautifully maintained. Lovely spa facilities and gym. Availablilty of tea in the library/ living room is a nice touch. Breakfast provides very good quality food! I like particularly the young coconut drink, very fresh! excellent! We went twice to the Chinese Restaurant for dinner. The enjoyed both the set and a la cart menu! Food were excellent and the presentation good, particularly the dishes in the set menu! The staffs were very friendly and helpful, answering our inquiries with patience and giving good appropriate advice! We also like the healthy fruit/flower drink in the mini bar and the high tea in the Library! Superb! The service was top knoll!!! Amazing service! Always a good experience! Room was true to picture in terms of design and size. I love love love the villa! However, the outdoor shower area was quite dusty and dirty which could need a little good scrub. Additionally, one of the base of the chair's "leg" in the room dropped out and was laying on the ground, in the living room area, with a sharp and thick needle pointing upwards. My husband almost stepped into it, which could have caused a serious injury if we did not spot it in time. Some of the buttons controller on the wall in the living room area were faulty. It took us many presses to make the buttons work to open up/close the curtains and the blinds. 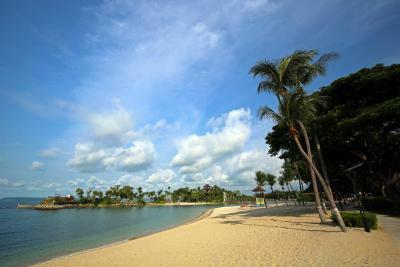 Hotel is not walkable to other places in Sentosa, it will be difficult to travel out if you are not driving. They provide shuttle service to Vivo City/RWS at certain timings though. It costed 1k for us to book the villa for a night but no breakfast was included. We are expected to pay an additional $56 per person if we want to enjoy the hotel's breakfast. It can be really costly. I love our stay in Capella Hotel. We are celebrating our wedding on the day itself and we were surprised with a bouquet of flowers right at the lobby while waiting for check-in. Checking in and out of the hotel was hassle free. Hotel was very kind to offer multiple buggy rides for my guests, to and fro my villa. Our requests from time to time (eg: Ice buckets, additional coffee nespresso capsules) were always answered quickly with their prompt services. I love the hotel and the staffs. The hotel room was true to picture and very comfortable. We are super excited to stay in the villa. It is a dog-friendly villa too. Dog bed and bowl were provided with a bottle of water. Downside is, the villa is NOT sealed, so our dog managed to dash out of the villa through the private pool area. 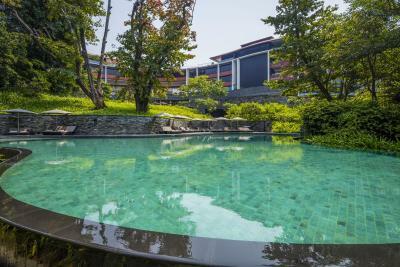 We have stayed in many other 5 stars hotel in Sentosa and across Singapore, but none of them made us feel special like how Capella did. 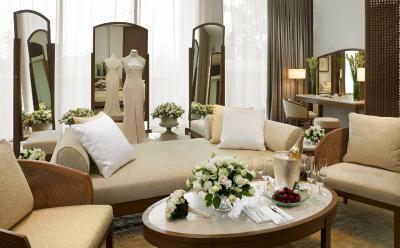 Although it can be a little pricey, it made my partner and I have a pleasurable and memorable wedding stay. I love how it is away from all the hustle and bustle city life in Singapore, and it is probably the only calm, peaceful and relaxing resort you can find in Singapore. Unexpected morning doorbell, woke me from the bed, for the service of "water my plants..." - though it was asked in a polite manner with an option, would it be better schedule the plant watering after staff checkout or when guest travels out from Capella? Warm staff (a special thank you to Mr. Vikneswaran Marimuthu, The Knolls Assistant Manager, who had an immediate response when my 2-years-old son fell asleep - he helped to arrange a place beside us, carried my son to that place and my son was comfortably slept on his shouder during the transfer, found a scaff from other staff and adjusted the surrounding ambience thereafter - his action did help us, especially my wife, and let us enjoy our dinner later whereas before he offered his help to us, my son lied on my wife's arm and my wife could not even cut his lamb back. Thank you, Mr. Vikneswaran Marimuthu! ), the room and etc. It’s a great hotel/resort to properly enjoy holiday! I was so happy staying here. The staff were all very hospitable and polite, everything was clean, it was 5 minutes walk to the beach... very nice for couples and families! Breakfast had limited choice of fresh fruits for a hotel of this stature and limited choice of eggs variety. Fresh fruits in the room not replenished daily. Chef was struggling to manage the egg station at the buffet. Often omelets were rushed and not ideally cooked. Suggest to hve 2 chefs to manage eggs station. The staff made our stay amazing, nothing was too much trouble. There are nice touches such as a free mini bar, drinks by the pool .